Wow! The ingenuity and innovative potential of human mind continues to amaze me! Few days ago, on April 11, 2016, Binghamton University researchers took the concept of using cyanobacteria, a phylum bacteria obtaining energy through photosynthesis, to produce clean energy. These researchers used nine biological solar cells, also known as bio-solar cells, and connected them to a biological solar panel, resulting in the continuous production of electricity from the panel. The amount of electricity it produced reached 5.59 microwatts, which is higher than what any small-scale bio-solar cells can produce. The paper was entitled “Biopower generation in a microfluidic bio-solar panel” written by Seokheun “Sean” Choi, an assistant professor of electrical and computer engineering in Binghamton University’s Thomas J. Watson School of Engineering and Applied Science together with graduating students Xuejian Wei and Hankeun Lee ’15, graduating in May, according to Science Daily. The Binghamton University Nanofabrication Lab provided the fabrication facilities for the work, while the University Research Foundation (Interdisciplinary Collaborations Grants (ICG) Program/Transdisciplinary Areas of Excellence) provided the funding. The findings are currently available online and will be published in hard copy in the June edition of the journal Sensors and Actuators B: Chemical. The breakthrough occurred last year, after this group of scientists attempted to innovate the dual-chambered bio-solar cell. They created a microfluidic-based single chambered device to house the bacteria, and they also changed the materials on the positive and negative terminals of the bio-solar cell. 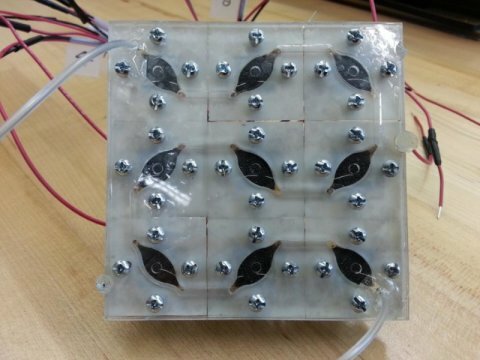 With further investigation, using a 3×3 pattern, the group installed nine identical bio-solar cells to form a bio-solar panel, which they observed for 60 hours. Their observation showed the continuous production of electricity due to the bacteria’s respiration and photosynthesis. It may be a very low amount of energy production as it can only produce 0.00003726 watts while a regular 60-cell rooftop solar panel generates 285 watts, but the great potential in this discovery may lead to a more reliable energy source, as reported by Energy Matters. “Once a functional bio-solar panel becomes available, it could become a permanent power source for supplying long-term power for small, wireless telemetry systems as well as wireless sensors used at remote sites where frequent battery replacement is impractical,” said Seokheun “Sean” Choi. When conservative naysayer commented to me,”What good is it?! It’s only able to generate such a small amount of power!” I’d retort, borrowing from one of Dr. Ben Franklin’s famous lines, “What good is a newborn baby?”, often used by Faraday as well….as we wait for the unfolding potential of one of many newborns in our Solar/Renewable Energy Age. This newborn baby offers great potential for a long-term, reliable power source in remote areas.